PRODUCTS INTRODUCTION: Wall oxygen intake device can be connected with the central oxygen tube,so it is convenient to manage central oxygen cylinders in the hospital or patient ward. It is mainly used for length time supply oxygen. 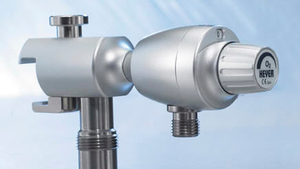 A flow meter measures the movement of a liquid or a gas. In the medical world, there are four principal uses for these devices. - Peak flow meters measure maximum respiratory flow in patients with asthma or other breathing difficulties. - Others measure oxygen and/or air flow through a mask worn by a patient, for example in intensive care. - Some measure blood flow, particularly useful for intraoperative monitoring and control of hemorrhage risk. - When measuring urinary flow, they monitor hydration and dehydration, or can be used to detect a urinary tract obstruction. Float flow meters take the form of a tube containing a small float whose movement yields a mechanical measurement of flow. Other types of device are used in the area of radiation protection. The most important factor is the required degree of accuracy. Choice also will depend on the substance to be measured, air, oxygen, blood, urine or another fluid.